I’m not sure what it is about donating organs, but this theme keeps following me around! Kazuo Ishiguro’s novel, Never Let Me Go, subtly augments contemporary Britain into a dystopic society with a unique population of children who have been specifically created – cloned to be exact – to become organ donors in their adult life. If it weren’t for this fact, Never Let Me Go might be mistaken as a typical story of friendship, love and jealousy set in a boarding school for students with high aptitude for art. Instead, it is the story of three friends – Kathy, Ruth and Tommy – and what happens when growing up intersects with the growing knowledge of what your purpose in life is. As adults, these three are reconnected when Kathy becomes Ruth’s “carer” – the person who cares for you through your “donations” until your “completion.” The reunion forces the three to come to terms with their time at the boarding school Hailsham where Kathy and Ruth were best friends, but friendship gave way to jealousy as Ruth observed a special closeness between Kathy and her boyfriend, Tommy. Unlike the characters of The Unit who are sent for donations only after being deemed as lacking value to society, the children of Hailsham have only one destiny. However, they are never really told this – as is read, they are “told but not told.” They are given small bits of information and this, with what they observe or overhear, they use to create in their minds what lays ahead for them in life. One particularly puzzling activity is that as they are encouraged to produce various types of art and then periodically “Madame” comes and takes the best pieces away for her gallery. The reason for this practice was woven into the rumors that the students create, and only many years later do Kathy and Tommy learn that it had less to do with them individually and more to do with them collectively. As the pair finally have the opportunity to be together as a couple, they confront “Madame” about her gallery and learn that as things seemed very orderly inside of Hailsham, on the outside, the leaders were facing a political battle and the art was used as evidence that the children had souls. Never Let Me Go really seems to be two books in one. The relationships that Kathy, Ruth and Tommy share are as round and worthy discussion as any trio I’ve met in recent fiction. And then there is this thing of the donations… and “possibles” and “completions” and “deferrals” – all euphemisms for ideas much larger than they seem. Neither story disappoints. I read this book several years ago and remember it being a bit of a struggle. I might try listening to it on tape again. Thanks for the review! Rebecca – I'll admit, listening to this on tape – especially at the first when I was just figuring out what was going on – I wondered if I'd be able to get through this one as a read. This is my first experience with him; wonder if the others are similar. I like Remains of the Day as a movie…. I read this one a few summers ago. I liked it, but it did take a while to figure out what was going on. I too found the relationships between the 3 kids to be more of the focus rather than the donation part. Or, that's what I was captured by the most. Interesting that you read this so soon after "The Unit"… It would make for a fascinating study in comparative lit class! Yes, tiff, I'd love to discuss this with a group that had read both! I have always found it curious that Ishiguro wrote this book. Full disclosure – I've only read Remains of the Day by him, so I can't speak to any of his other works to any significant degree. However, because I loved RotD, I follow him & am always interested in what he's doing. His topics are pretty diverse. I mean Remains of the Day to Never Let Me Go? Pretty impressive. No one can accuse him of operating within narrow margins. I want to take a moment & congratulate you on a wonderful year of blogging, Elisabeth. I enjoy your blog so much, and your reviews are thoughtful, fair, insightful, & fun to read. Also, the amount of content you put up each week is pretty incredible to me. Know that you've got a faithful reader in me. @Stacie – One thing I found myself thinking as I listened is that I was amazed that a man wrote this book. He is incredibly insightful regarding women, how women think and in particular, how women think when there is a 'shared' man. At one point specifically Ruth confronts Kathy about her (Kathy) relationship with Tommy. The specific things that she says are so on target for what a 'girlfriend' would say to one of her boyfriend's female friends when she has very poor motives. As a female it is obvious what she hoping to (and did) accomplish. My hubby and I have had multiple conversations over the last few years about what women say and what they really mean. The hubs often doesn't get it, and actually most men I've discussed this with, don't get it. They just think that the 'interpreter' is being catty. 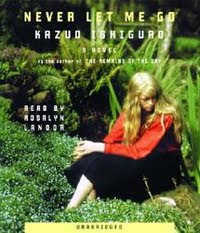 Ishiguro proves in this novel that he get's it. When women are in confict with one another, there is what is said verbally and then there is the real message. Pretty insightful – I thought – for a man. How interesting that Ishiguro seems to have an inside track on women's minds. The chasm between what a woman may say and what she means can be thrilling territory to explore. This information you shared makes me really want to read this book. To my TBR! Thank you for extending the guest review invitation to me again. I would love to do it. As I read over the next few months, I'll see what strikes my fancy. Thank you for being patient… I know we talked about this some months ago.